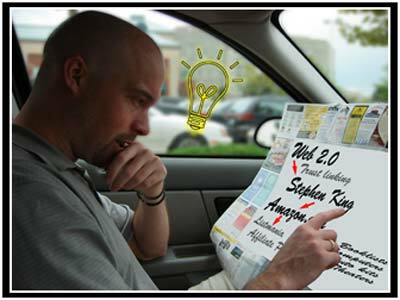 You know about Web 2.0, right? Social networking, the semantic web, blah, blah, blah. Well, I got to thinking about the one aspect of that stuff I actually buy into: Trust linking. There are a hundreds — maybe even thousands! — of hyperlinks out there on the world wide web. You can’t check every web site to see if it might contain something that’ll interest you. Instead, more often than not, you rely on some other method. Searching for specific information is easy — Google to the rescue — but I’ve noticed that when I’m just surfing, I only really follow links that are either popular (everybody’s linking them) or links presented by people I trust. If I enjoy a website, I’ll probably bookmark it or, better yet, subscribe to it. And later, if the owner of that site decides to link to another site, there’s a good chance I’ll follow along. Why? Because by bookmarking their site, I’ve decided that their opinion is worth reading. I trust that the author won’t waste my time. The content they’re linking to may not even be in one of my areas of interest, but often I’ll give them the benefit of the doubt. It’s the trust that matters. Web 2.0 sites like Technorati are based on popular linking. Del.icio.us thrives on trust. Okay, moving on. So Entertainment Weekly has a column written by Stephen King. Recently he used the space to list his favorite books of 2006. After reading the article, I thought that it might be interesting to purchase those ten books and make a goal to read them all. I trust Stephen King’s opinion on writing; I’m sure it would be money well spent. Now, you can click on all those links and individually add them to your cart at Amazon.com. Convenient, but not perfect. Every online store should have an “export shopping cart” button. Before checkout, any customer could export their entire shopping list to a file [or whatever; something stored in the site’s database, I would imagine] and be supplied with a reference URL to that file. They can then copy/paste this URL wherever they like (i.e., their blog.) Anyone else clicking on the link will be taken directly to the online store’s site and their own shopping cart will be instantly populated with the same items. That entire list above could be shortened to something like: Arlo’s Sci-Fi Bookshelf. Click that hypothetical link and you’d be set to approve the purchase of the entire set one click later. A notable reviewer of stereo equipment puts together the killer home theater system from components sold at J&R Music World. The geek that pwned everyone at the last LAN party shows you the breakdown of the custom-built computer he bought from Newegg. The DJ with the best mixes hooks you up with the perfect CD collection from Walmart (of all places). The weekend mechanic that tricked out his Honda Accord gives you a list of all the parts he ordered from NAPA Auto Parts. A popular film critic creates the perfect (comedy, action, drama, animation) DVD movie collection at Best Buy. With a little bit of effort, even clothing stores like The Gap could alter sizing information based on a shopper’s profile so that the fashionable could create tailor-made wardrobes for the masses. Any time two or more items are sold together, an online store could conceivably benefit from an exportable shopping cart. What do you think? Could it work? Should I start the patent application? P.S. Those sci-fi books really are great. Trust me. I like the idea. I especially like the premise that someone could create a “permalink” to a customized list of items – perhaps I wouldn’t want them all added to my cart, but I’d want to see all the items as though it was a search on amazon of “Arlo’s favorite books” or on Dell with “Alro’s tricked out WoW gaming machine”… To give me a list (rather than a cart) would allow me to customize my order to my own pocketbook as I’m often behind the curve of your toy purchases, Mr. Moneybags. Well, if it’s just a list you’re after, we may as well just use the systems that are already in place. Or maybe Amazon is on the right track with Listmania. Not that my idea wouldn’t work for what you described. You could always “click through” the URL, get to the shopping cart, and then REMOVE any items you don’t want. No reason you have to buy all of them, even though it’s set up that way for your convenience.